I really like Adelaide Zoo, it's pretty low key and relaxed but it's also got heaps of great exhibits, it's easy to get around and to get to, it's cheaper than Taronga and now it's even got Pandas! We didn't think we were going to get to see them as you have to book ahead but the nice ticket lady gave us some passes to get in. The 30 minute queue was worth the wait as they put on a pretty good show. We also saw lots of other stuff, and Jon had to chase down a goat that a dorky parent managed to let escape from the double gated petting zoo. In fact it was lucky we didn't all get stampeded in the rush of animals leaving the petting zoo - I think they know what to do when they see dorky parents and open gates as suddenly bambi and the gang were up and hustling to get out. Happily only the one goat escaped and Jon didn't get sprung by a zoo keeper as it might have looked like he was making off with an alternative Christmas Lunch. One of my least favourite school activities is the Final Year Assembly - the kids sing funny christmassy songs, the teachers say nice stuff, other people get thanked and it's all fine and dandy (if a little long) EXCEPT for the grade 2 kids 'graduation' ceremony thing which I just can't abide by. Ok so the school only goes up to grade 2 and the eldest kids are going on to different schools which a big event but this whole graduation thing (which ALL the parents and other kids have to watch) really leaves me squirming - as it seems completely over the top for what is a small milestone on their educational pathway. Anyway this overly long assembly means I'm generally unpleasantly derisive of the whole thing much to the annoyance my good-cheered fellow audience members (i.e. Denny and Jon) and I walk away feeling like the biggest scrooge in the land and they walk away thoroughly sick of me and my bad attitude. Today however I'm feeling a slight bit of redemption having read this article in the SMH. Maybe the author can be my new best friend and we can send our kids to the same school and mutter obnoxious comments under our breaths at the back of the audience together and be thoroughly disliked by everyone else. Except of course when our kids are graduating and we will insist on them receiving every bit of the fanfare the previous years kids have had..
Wellington Falls can be reached by a fun flattish Mountain Bike Ride and then a 2km walk out and back, or a 4 hour walk from The Springs via Dissapearing Tarn (unfortunately it had dissapeared the day we did it) then back to Neika where we had left a car. It went through every sort of terrain possible yet managed to be relatively flat for a mountain walk. The track crossed boulder fields, marshy swamps, through tall trees and into pandanda forests where it was hard to hear over the buzz of the bees in the flowers. The mountain offers something for everyone I tell you! 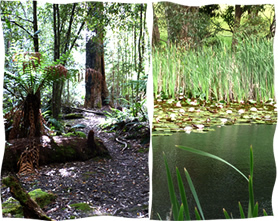 And just to prove that I have actual friends you'll see these photos feature my two walking buddies. Ok. So maybe one is my sister. oh ok so what that the other person is one of her friends - what's your point? sigh. Starting from the north end of Kingston Beach, the Alum Cliffs is a nice (undulating) 40-45 minute return run, or walk out to a lookout and back. It used to just be a series of steep ascents and descents but it's been re-routed so it's much more walkable and runnable. The views along the way are really nice. The only drawback for dog-o-phobes is that it starts from the Kingston dog beach, so you normally have to put up with a few dogs for the first few minutes. 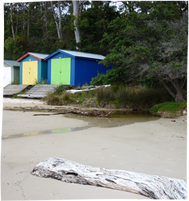 I was a bit tired of the mountains so today I decided to do a coastal walk starting from Coningham Beach - 15 minutes drive south of here. 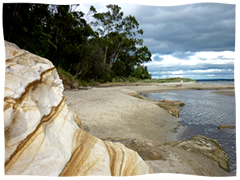 The 80 minute walk goes along the foreshore, up a great big bugger of a hill, then back down to the beach again. This walk is pretty runnable - although it is a bit of a slog up the hill. There are tonnes of great tracks on the mountain but I'll try to limit myself to blogging 3 or 4 good solid walks. 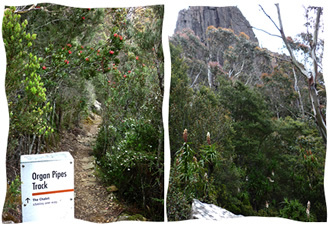 Yesterday I walked the Pinnicle track which links to the Organ Pipes track, which then drops down to Hunters Track and returns via the Lenah Valley track. It sounds more complicated than it was. Once again it's undulating but most of the uphill is done in the first 30 minutes. The views up and down are fantastic and it took me almost exactly 2 hours including some drinks and photo stops. I'll have to remember to do this walk around Christmas time again next year as there were tonnes of flowers out so it was even nicer than usual. On Thursday we upheld one of the McComb Family Christmas Traditions (Est. 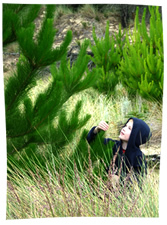 2008) and went out to Pittwater Dunes to hunt down our own Christmas Tree. As usual they weren't putting up much of a fight so we soon selected a smallish one which turned out to be too tall for the living room. It's funny how they look so modestly sized out in the open, but when you bring them home they are huge. Zali is pretty good at handling all kinds of bugs and removing spiders from the house. 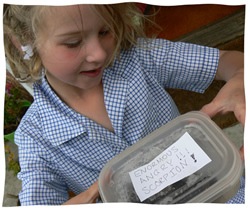 Happily though, she does draw the line at handling scorpions - and the other day Jon unearthed a huge one! 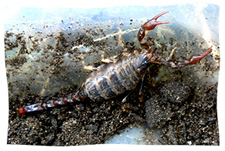 We've had quite a few small ones around the house this year (something to do with the wet weather I think) but this one was massive in comparison - check it out - ugg... Tasmanian scorpion stings aren't fatal or anything but they are creepy. Cat-astrophy - get it? Hillarious. Anyway - The other day I had to do a set of figurines fishing with their cat next to them. 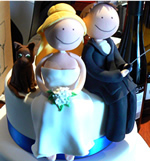 The fishing bride and groom was fine, but I ended up spending a rediculous amount of time on the cat and I was never really happy with the results. The first cat looked more like a mouse (and turned out to be the wrong colour) and all the other variations tended to look like dogs or wolves or wallaby's with cat heads or gargoyles or just blobs. In the end I went with the cat 2nd from the left but you can see it has a bit of a dogginess about it. Normally Jon and Jett are home alone together on Thursdays and Fridays. Today I am crashing their party and we've been out to the library, off to swimming lessons, to the bakery for rolls for lunch, now we're having a cruisy few hours before heading off to get Zali and the gang from school. 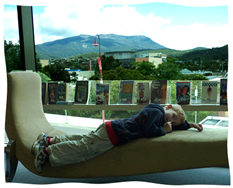 This is Jett at the library after an exhausting game of chess. For non-tasmanians that's Mt Wellington in the distance. This walk starts only a ten minute drive from our house and even better, the drive takes you past the legendary Bush Bakery in Leslie Vale. The walk itself took me just over two and a half hours and after the first half and hour it is really pretty steep for the rest of the way. The views from the top are fantastic of course and the track is really good. On the way down I had stare-offs with two snakes who were sunning themselves in the middle of the track. After a few moments of of glaring at eachother I remembered that I had the ultimate advantage in this war of wills... arms - so I threw a few sticks at them and they moved along. I also saw numerous wallabies (or pademelons or potteroos or some other sort of stunted kangaroo) and a very cute echidna. This walk is was fantastic but my next walk is going to be flat! Raspberries - only $34 each! Excitingly some of our raspberries have made a comeback and today I ate about $68 worth (i.e. two). They were good though. On the other hand our strawberries are going pretty well - it seems the more we neglect them, the better they fruit. 101 ways to get away from the kids..
Or something like that. 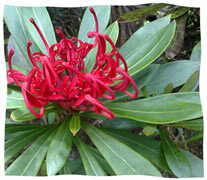 Astute observers will notice I've created a new page on my website called '20 walks near hobart'. 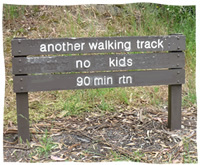 Basically my aim is to have a section on my website for my own amusement which features all the walks you can do in and around hobart while the kids are at school - or at least being babysat by people you don't have to pay. I've done one so far but I recon I might be able to find 20 interesting ones.And when I am able to edit photos again in a more sophisticated manner than printing them out and shrinking them on a photo-copier I'll be able to illustrate my walks - but for now it will have to be a text only page - boring. This is a steep walk that goes from Suicide Bend in Taroona, up to the Mt Nelson Signal Station and back. Walked briskly with only minimum time taken to pause and cough out a lung, it can be done in a shade under 55 minutes. If you run it you should try and get to the top in under 20 minutes if you want to be respectable. When I was young I could do it in like 7 minutes. or something like that - my memory is a little hazy.